Not many people will be familiar with the name Gary 'Toe Cap' O'Reilly. Fewer still will be aware of his pivotal role in the history of music, but this may soon change following the publication of his autobiography. "I wrote it myself," said Gary. The book tells of his early life as a roadie, working for bands like Deep Purple, Free and Genesis. Clearly it wasn't always a glamorous life, as his more unsavoury anecdotes attest. In particular there is an unpleasant account of having to empty Ian Anderson's codpiece while on the road with Jethro Tull. And the chapter concerning the innumerable times that Gary had to sift through Keith Moon's vomit to try and find his car keys is enough to put you off noodles for life. "I did all the words and everything. All on my own," Gary told us. So it's understandable that every now and then, things just get a bit too much. That's certainly what happened when Gary was touring with the Bee Gees in 1975. Every night, before each gig, Barry Gibb insisted that his teeth needed to be buffed. One night Gary finally flipped and booted the bouffant Bee Gee in the nuts. Barry proceeded to perform that night's setlist in a falsetto, which not only went down great with the audience, but also made the band a hit with some of the local canine population. A whole new sound was born and henceforth Gary was employed to kick Barry in the testicles before every performance. "The man at the publisher's office helped me with some of the spelling. But I did the rest all myself, and everything," Gary said proudly. Over the years, Gary's talents have been in huge demand and he has helped some of the most iconic performers in the business to achieve their signature sounds. Everything from stamping on Freddie Mercury's fingers, to tickling the back of Prince's neck and giving Robbie Williams a Chinese burn. 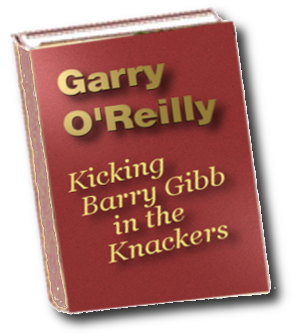 His autobiography, Kicking Barry Gibb in the Knackers, is published on Monday.